So, there has been something that has been bothering me and I wanted to get it off of my chest. It has to do with how the Twili have snakes on pretty much most of their artifacts and it seems to even be a part of their culture. 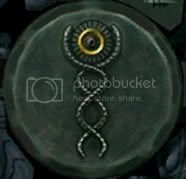 We see a snake on the fused shadow that Midna wears, we even see snakes on many of the Twili's architecture and buildings. Even Zant's helmet resembles a reptile in many ways. Even the shadow beasts have snakes on their masks. Now we can admit that there are serpent/snake like markings on all of these pictures, but you may be asking yourself "What does it all mean?" Well for starters I can only think of one race in the zelda series that use snakes throughout most of their culture. 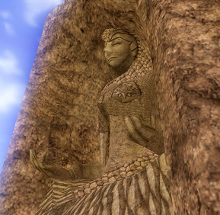 They would be the Gerudo, the Gerudo in past zelda games such as Ocarina of Time have snakes on many things they are associated with such as the Spirit Temple. The entrance to the Spirit Temple features two snake/cobra like statues with text written on them giving you a hint on what you must do to progress through out the game. The Spirit Temple also has alot more snake like symbolism such as the outside entrance and further into the the dungeon where the boss entrance room is. Even in Twilight Princess we see a structure very similar to the one from Ocarina of Time right before you find out that the Mirror of Twilight has been shattered into 4 pieces. 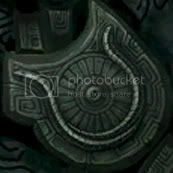 So with that said I would like to conclude this little speculation by saying that the Twili might be of Gerudo origin. Now I know there are many holes in what I just stated above but I am not going into much detail because this kind of thing was talked about before in the zelda community, so if you want to look into this further I suggest you go and google some theories on the Twili. An army of rebels rose up and attempted to seize the sacred realm, led by the infamous Ganondorf. A civil war ensued, and Dark Interlopers created the Fused Shadows with dark magic, which the goddesses then sealed away. The rebels were then banished to the Twilight Realm, where, according to either Midna or Zant (I forget which), they evolved into the Twili. They could have been Gerudo, but Ocarina of Time is set after this war, and there are still Gerudo present in the game (obviously). Maybe not all of them were banished, but it's just an observation. As for the location of the Mirror... Arbiter's Grounds is a prison for the worst of the worst. Essentially Hyrule's most wanted, correct? Where would be the best place to hold these monstrosities? Not Castle Town, or another populated area. No, you put this prison in the middle of the desert, so that if someone escapes - oh no! - they have nowhere to go. Maybe the Mirror is there because of the Gerudo, but I think it's just the optimal place for a prison. So, who are the Twili? *shrugs* Could be anybody. They evolved, remember? I don't think Ganon had any part in the Hylian war, that was pretty early in the timeline if I'm interpreting that cutscene correctly, and Demise is pretty much the man behind the other man, Ganon didn't really exist before him, I don't think so anyway. Oh well, minor mistake. Doesn't change my theory much. Edit: but wait! "He was the leader of a band of thieves who invaded Hyrule in the hopes of establishing dominion over the Sacred Realm." So... This happened more than once? Isn't that quote just a description of Ganondorf and what he did in Ocarina of Time? This is what I have thought of as well, The events described in Twilight Princess obviously happened way before Ocarina of Time and there are Gerudo in that game. But who says they banished all of the Gerudo? I am also starting to think that maybe the Twili are not one race but are consisted of multiple races instead such as Gerudo, Sheikah, etc. Who knows? Maybe the Twili are actually the sword like race in Skyward Sword such as Ghirahim and Fi. But I dont think there is enough evidence to confirm this. It could be, but it could mean something else, and I dont remember Ganondorf in OOT trying to gain dominion over the sacred realm with other Gerudo. I thought that it was just him who managed to make it into the sacred realm. The events described by Lanayru obviously occurred long before Ocarina of Time ever took place. Personally, knowing what we know now, I'd say that sometime after Skyward Sword seems about right. Everything would be incredibly fragile politically, the races would not have been united and likely warring with each other (for the former Skyloftians, fighting 'monsters' in their new home; for the original inhabitants, just trying to survive being ethnically cleansed...). It's the perfect time for a band of dark sorcerers to try to seize control. While I do agree that the Twili are likely some hybrid of Sheikah and Gerudo (they bear both tribes' symbols; the throne has a Sheikah eye and Zant has a Gerudo symbol on his clothes), I'd say that it's likely they're sort of a mutt race. Every humanoid group has likely pulled their genes around in some direction at some point in their history; remember, it was effectively a penal colony of the World of Light's and Lanayru seems to suggest anyone could take up arms and fight their neighbors when coveting the Triforce. The snake imagery is like a nod to how, in various real world mythologies, snakes are almost universally considered trickster/dark figures who exist to torment or bring humanity low in some way. Indeed, the most famous, Satan as the snake with Adam and Eve, likely played some influence; Christian imagery is weirdly popular in Japan. I totally agree with you. The interloper war would have had to take place before Ocarina of Time. I also agree that it seems more likely that the interlopers are not just one race but a bunch of races and tribes that joined together to try and gain entrance into the sacred realm so they could get their hands on the sacred relic known as the Triforce. The mixed races theory also helps support the fact on why most of the Twili are male but this could be due to technical reasons. Personally, though it isn't really canon I guess, I've always gone with the idea that the Twili look more like Midna and returned to their 'true' forms when she did too. As for Zant, well, looking weird a possible price for siding with Ganondorf? Then again, Zelda's never cared about stuff like this too deeply; see the Lokomo and Oocca. I like to think the reason why Midna looks so different from all the other Twili is because she is the true leader of the Twili. It also has to deal with the way they designed her. They probably made her look different because they wanted her to stand out from the rest and give the player the impression that she is really beautiful. I honestly think that the appearance of the Twili in Twilight Princess were their true forms and they were already purified because Midna even says so. I would also like to point out that Midna is the only known female Twili which could also be why she looks so different.